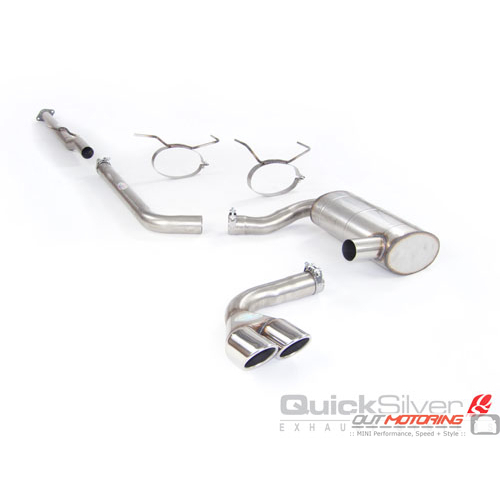 QuickSilvers 'SuperSport' exhaust system for the MINI Cooper S R53 and convertible Cooper S R52 is a fantastic product. The result is a lighter weight system that has more efficient flow and shows a noticeable improvement in throttle response whilst enhancing the vehicles sound. Features a single oval tip to fill the rear valance on the S model. This SuperSport option is designed to unleash much more presence and volume whilst working with the engine throughout the rev range, at lower revs the sound has more depth and at higher revs it provides a crisp note. - A distinctive Mini Cooper sound. - Dyno showed a 14 bhp improvement (independent test).